Lifestream Bioactive Spirulina contains a powerhouse of nutrients including iron, phycocyanin, GLA and carotenoids and when used in conjunction with a healthy balanced diet, may help you feel energised all day. Lifestream Bioactive Spirulina was handpicked for its purity and nutritional potency from 35 varieties worldwide. Spirulina, a spiral shaped microscopic fresh water plant, contains one of the richest concentrations of nutrients known in any food, plant, grain or herb. It has an excellent balance of nutrients including chlorophyll, carotenoids, vitamins, minerals, unique phytonutrients and all the essential amino acids. Spirulina is low in calories and fat and is one of the highest protein vegetarian foods. Lifestream Spirulina is a genuine health food. Spirulina powder, Silica, Magnesium Stearate. Children 6-12 years:3 tablets (1.5g) daily. Increased amounts up to 18 tablets can be taken as advised by your healthcare professional. Should not be used as a substitute for a varied and healthy lifestyle and diet. Below are reviews of Lifestream Spirulina - 1000 x 500mg Tablets by bodykind customers. If you have tried this product we'd love to hear what you think so please leave a review. Spirulina is a natural, highly absorbable food source & I feel better when I take it. When I stop taking it, I sense a drop in my overall vitally. Cheaper brands don't match up to lifestream. Have been using for over 10 years first bought in New Zealand. Good price and fast delivery. It is when you stop taking this product, that you realise just how good it was for you. I will always include it now in my lifestyle now. Brilliant product at a very good price. I have been using Lifestream Spirulina after being recommended to try it by a natural healing consultant. It works for me and I wouldn't be without it. I feel great. 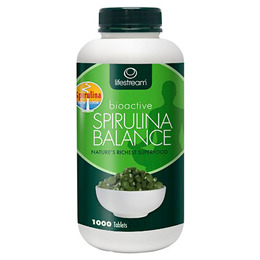 Question about Lifestream Spirulina Balance - 200 Tablets What is the difference between Spirulina and Blue Green Algae? Spirulina is a Blue Green Algae. There are different varieties of blue green algae of which Spirulina is one. Wild Blue Green Algae, also referred to as Klamath Lake Algae is another type. They are very similar nutritionally. However, you will pay a premium for something that's described as 'Wild Blue Green Algae' or 'Klamath Lake Algae', however, we feel the extra costs do not justify the slightly increased nutritional values.